Harold E. Wolfe, Jr. Esq. holds dual certifications in both Taxation (since 1985) and Wills, Trusts & Estates (since 1987). Mr. Wolfe is only one of about 40 attorneys who hold dual certifications in Taxation, and Wills, Trusts & Estates in the State of Florida. He has been practicing law for 34 years and practices exclusively in the area of Taxation, Wills, Trusts & Estates, and Business Law. Harold E. Wolfe Jr., Esq. 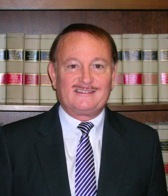 Harold E. Wolfe, Jr.- Board Certified Attorney in Taxation, Wills, Trusts and Estates. As indicated in greater detail in our explanatory web pages, we represent clients in all major areas of tax controversy work in South Florida including Palm Beach County, Broward County, Miami-Dade, Martin, St. Lucie and Monroe Counties as well as all across Florida. We have successfully represented clients before the I.R.S. Appeals Office, in the United States Tax Court, in the United States District Court and the United States Bankruptcy Court typically in more complex tax cases or tax cases that have reached an advanced level within the Internal Revenue Service or are proceeding into court. We would certainly invite review of our reported decisions in tax matters and a review of our frequently asked questions regarding tax matters. We also handle probate and trust administration matters in the Florida courts. These range from routine formal administration, probate administration cases to probate and trust litigation matters as well as representation of personal representatives, trustees, estate heirs and trust beneficiaries depending on the client’s particular needs. 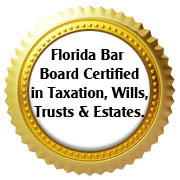 Harold E. Wolfe, Jr. is Board Certified by the Florida Bar in both Taxation and Wills, and Trusts and Estates, he offers a vast amount of knowledge and experience in Estates and Trusts area that often involve multi-disciplines. Given that he has been practicing law in these areas for more than 34 years, the firm offers a depth of experience in these complex areas. We work throughout the State of Florida with particular interest in Central and South Florida. Since tax appeals (written protests) are usually filed in the Miami-Dade, Fort Lauderdale, Jacksonville and Tampa offices of the Internal Revenue Service, we handle tax cases throughout the Florida (and for that matter we are often called upon to represent tax clients out of state) due to our experience. Harold E. Wolfe, Jr. offers the experience needed to combine a readiness to litigate with the skill to work out a negotiated settlement with taxing authorities.